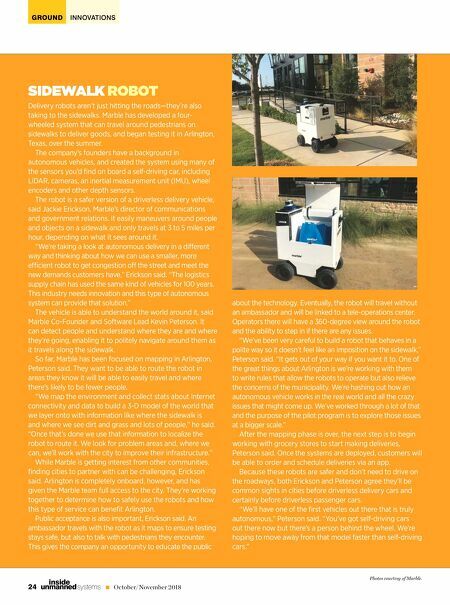 24 October/November 2018 unmanned systems inside GROUND INNOVATIONS SIDEWALK ROBOT Delivery robots aren't just hitting the roads—they're also taking to the sidewalks. Marble has developed a four- wheeled system that can travel around pedestrians on sidewalks to deliver goods, and began testing it in Arlington, Texas, over the summer. The company's founders have a background in autonomous vehicles, and created the system using many of the sensors you'd find on board a self-driving car, including LiDAR, cameras, an inertial measurement unit (IMU), wheel encoders and other depth sensors. The robot is a safer version of a driverless delivery vehicle, said Jackie Erickson, Marble's director of communications and government relations. It easily maneuvers around people and objects on a sidewalk and only travels at 3 to 5 miles per hour, depending on what it sees around it. "We're taking a look at autonomous delivery in a di‰erent way and thinking about how we can use a smaller, more eŠcient robot to get congestion o‰ the street and meet the new demands customers have," Erickson said. "The logistics supply chain has used the same kind of vehicles for 100 years. 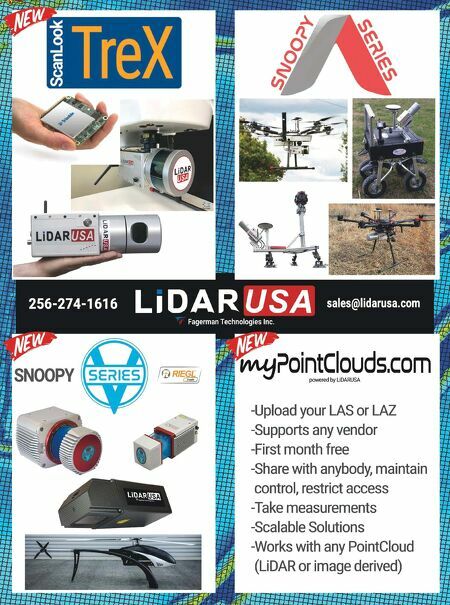 This industry needs innovation and this type of autonomous system can provide that solution." The vehicle is able to understand the world around it, said Marble Co-Founder and Software Lead Kevin Peterson. It can detect people and understand where they are and where they're going, enabling it to politely navigate around them as it travels along the sidewalk. So far, Marble has been focused on mapping in Arlington, Peterson said. They want to be able to route the robot in areas they know it will be able to easily travel and where there's likely to be fewer people. "We map the environment and collect stats about Internet connectivity and data to build a 3-D model of the world that we layer onto with information like where the sidewalk is and where we see dirt and grass and lots of people," he said. "Once that's done we use that information to localize the robot to route it. We look for problem areas and, where we can, we'll work with the city to improve their infrastructure." While Marble is getting interest from other communities, finding cities to partner with can be challenging, Erickson said. Arlington is completely onboard, however, and has given the Marble team full access to the city. They're working together to determine how to safely use the robots and how this type of service can benefit Arlington. Public acceptance is also important, Erickson said. An ambassador travels with the robot as it maps to ensure testing stays safe, but also to talk with pedestrians they encounter. This gives the company an opportunity to educate the public about the technology. Eventually, the robot will travel without an ambassador and will be linked to a tele-operations center. Operators there will have a 360-degree view around the robot and the ability to step in if there are any issues. "We've been very careful to build a robot that behaves in a polite way so it doesn't feel like an imposition on the sidewalk," Peterson said. "It gets out of your way if you want it to. One of the great things about Arlington is we're working with them to write rules that allow the robots to operate but also relieve the concerns of the municipality. We're hashing out how an autonomous vehicle works in the real world and all the crazy issues that might come up. We've worked through a lot of that and the purpose of the pilot program is to explore those issues at a bigger scale." After the mapping phase is over, the next step is to begin working with grocery stores to start making deliveries, Peterson said. Once the systems are deployed, customers will be able to order and schedule deliveries via an app. Because these robots are safer and don't need to drive on the roadways, both Erickson and Peterson agree they'll be common sights in cities before driverless delivery cars and certainly before driverless passenger cars. "We'll have one of the first vehicles out there that is truly autonomous," Peterson said. "You've got self-driving cars out there now but there's a person behind the wheel. We're hoping to move away from that model faster than self-driving cars." Photos courtesy of Marble.